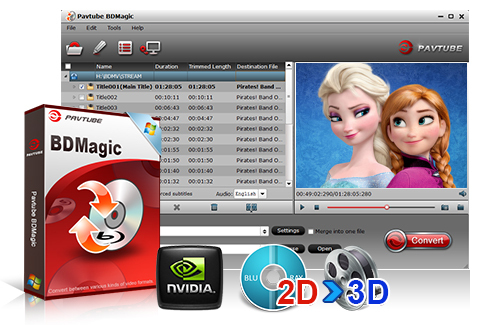 Pavtube BDMagic is a fully loaded yet easy-to-use software tool to backup, convert, edit and share your BD/DVD movies. With it, you can effortlessly decrypt and convert your Blu-ray/DVD discs to any popular video/audio format such as MP4, AVI, MKV, WMV, MP4, etc. The converted video files can be anywhere including Apple iOS devices or android OS tablets/phones or Windows media player and phones. With its video editing features, you can also customize your Blu-ray/DVD files to make the converted files your own patent. What’s more, you can freely rip Blu-ray and DVD disc to 3D videos for playback on various 3D players. Rip Blu-ray/DVD to media files in almost all formats, like AVI, MP4, WMV, FLV, MPEG, MOV, MKV, RMVB, FLAC, AAC, AC3, AIFF, AMR, M4A,etc. Convert Blu-ray DVD to popular media players and devices, like iPhone, iPhone 4S, iPod, iPad, iPad 2, the New iPad, PSP, PS3, Apple TV, Zune, Xbox 360, Blackberry, Android phones, etc. Turn 2D Blu-ray/DVD videos from discs to 3D videos in MKV/MP4/MOV/WMV/AVI formats with Side-by-Side, Top-Bottom, or Anaglyph 3D effect. Rip 3D Blu-ray movies to 3D videos for enjoying on 3D devices.You are allowed to set the 3D depth to adjust the 3D effect. 1:1 copying BD/DVD Disc content to local computer or external hard drive in original file structure with all subtitle tracks and audio streams preserved. Directly Copy BD/DVD main movie content and leave out extras, commentary, etc..
Cut off unwanted video parts; remove black edges or add watermark or special effects. Add subtitles into your Blu-ray/DVD movie and save as personal creation for enjoyment. NVIDIA CUDA and ATI StreamWith NVIDIA’s GPU or AMD’s CPU, you can get six-times-faster conversion with higher quality. Easy to use and simple interfaceOnly with a few simple clicks to finish BD/DVD ripping. Create personalized videosCustomize profile parameters, rename and save it for easy access to next conversion.